Rogers Rock Campground offers both individual and group camping facilities. There are a total of 332 campsites available at the vast campground. The two areas for group camping accommodate 35-60 people, and they are available on a pre-paid first-come, first-serve basis through mail at the NY State Department of Environmental Conservation's Warrensburg Office. These areas have a maximum stay of 14 days for campers. 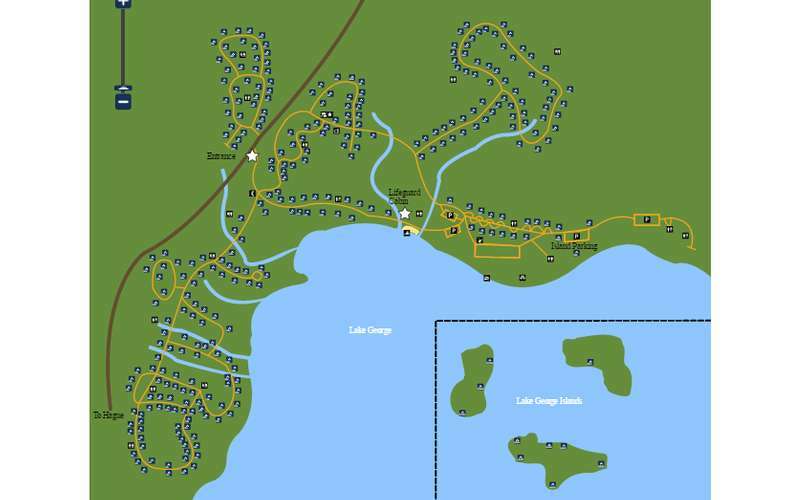 Amenities and facilities at the site include restrooms with showers, a trailer dump station, a boat launch, a sand beach, firewood sales, guarded swimming area, fireplaces, mooring buoys, a recycling center, a boat pump-out station, a bathhouse, and pay telephones. In addition, there are BBQ grills and picnic tables available, as well as a pavilion that can be rented for $50 per day. The day use fee to access the campground is $10 per car.